Despite the onset of Typhoon Lando, the members of Quota International of Manila South traveled two hours southeast of the city left on October 18 to Calauan, Laguna. In partnership with the Brotherhood of Christian Professionals and Businessmen (BCBP), Manila South Quotarians served 712 patients, all informal settlers from Metro Manila, of the Don Bosco Compound. 206 three-strain flu vaccines were administered to the elderly, volunteers and orphans. 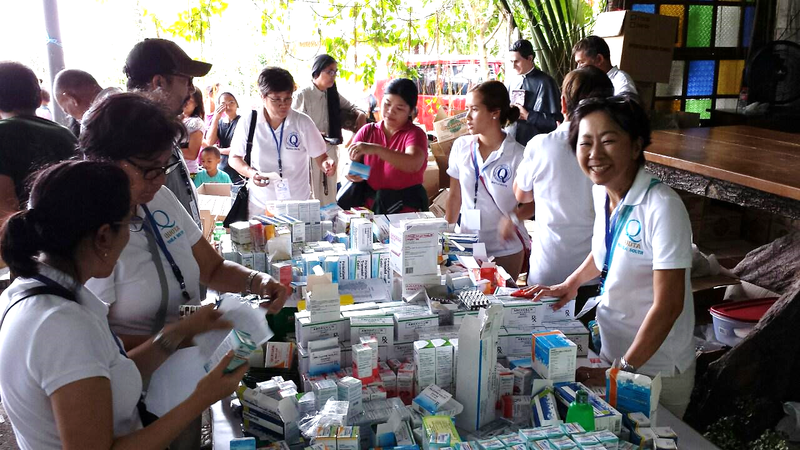 Medicine donated by different pharmaceuticals was distributed along with wellness products like lotions, shampoos, soap, toothbrushes and toothpastes. Consultations for the adults and children, in addition to dental services. After all consultations were completed, the patients, volunteers and doctors were treated to a delicious warm chicken porridge. The children were entertained by BCBP members with various coloring and drawing activities. To learn more about Quota International of Manila South, and how you can help their medial missions throughout the region, visit their Facebook Page. post submitted by Vice President Emilie Simon.